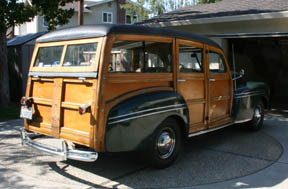 This project is a '42 Mercury, owned by Carl Biggs of Scotts Valley, CA. 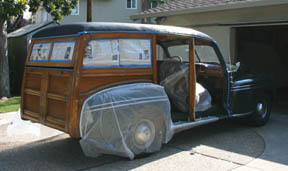 The car will get the exterior stripped, sanded, bleached and varnished. The main structure appears fairly solid, but there have been repairs attempted here and there which need to be assessed and repaired. All the external hardware was removed and initial taping of the areas to be protected was begun. 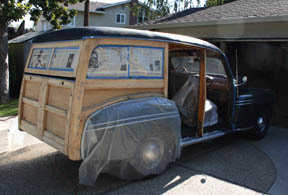 I decided to take the doors off, because they are easier to work on flat and I will be adding new weatherstripping, which is hard to do with the doors on the car. The varnish stripping process has begun. 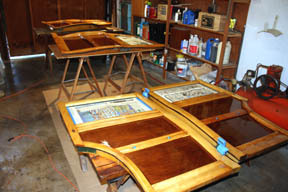 Several coats of stripper solvent are required to get off all the layers of old varnish. 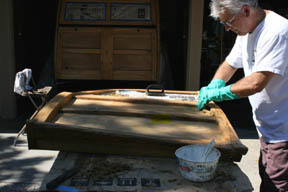 Here I'm using a flat sheetmetal paint scraper to get the varnish residue scraped off of the door panel. Always scrape with the grain of the wood. I use the sheetmetal scraper everywhere I can. Notice the heaps of varnish I just scraped off the panel on the right. A normal scraper and a 3M scrubbing pad are also used to clean the surface after scraping. With all the varnish stripping done, the wood is sanded in preparation for bleaching. Bleaching with dissolved oxalic acid crystals has begun. I brush on the solution, wait about 15 minutes and then scrub with a 3M scrubbing pad made for wood, and sponge off. 2-3 applications may be required. 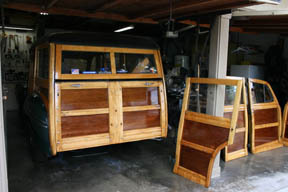 Here I'm applying wood bleach to the door on the left. 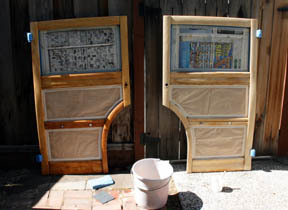 The right door has been bleached and is drying. I covered the panels with plastic sheeting to protect them during the bleaching process. If alot of bleaching is required, wash off the wood with a white vinegar solution of about 4 to1, to neutralize the bleach that soaks into the wood. After bleaching, the doors are sanded again with a finer grit paper in preparation for varnish. 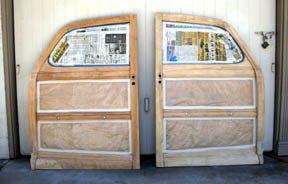 The door on the right is sanded. 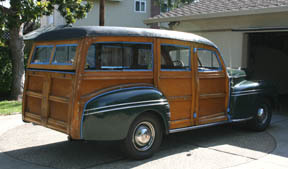 Any wood repairs are done at this stage. 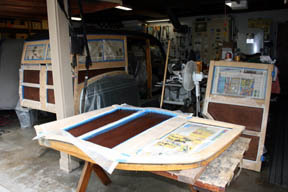 Here I am staining the panels a red mahogany color, to give more contrast from the maple. 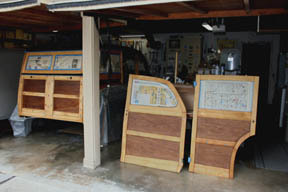 The panels had some discoloring in them and the stain will help mask the darker areas. 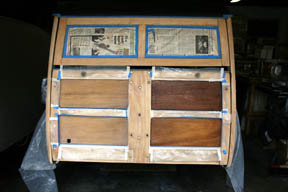 First I apply a pre-stain conditioner (bottom panel) and then the stain (top panel). 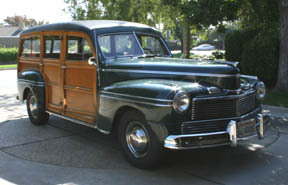 The conditioner helps control the amount of stain that is absorbed in the wood. 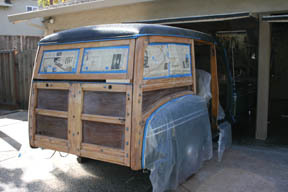 Here all the door and body panels are stained. Once the varnish is applied, there won't be such a big contrast in color between the maple and the mahogany. The first coat of varnish, thinned about 25%, is applied. 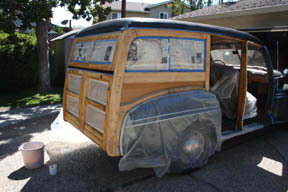 This coat will soak into the wood and bring out the natural tone of the wood. 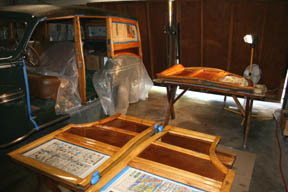 With three coats of varnish on, the wood is starting to achieve the warm glossy look that only varnish can provide. 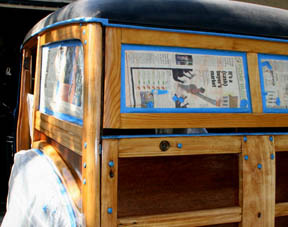 Sanding between coats, it will take at least another three coats to get a nice smooth glossy finish. 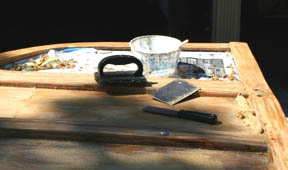 After scuffing the surface with 320 grit sandpaper, another coat of varnish was applied without thinning. This coat gives a nice glossy, smooth surface. After another light sanding, the next coat of varnish is added. 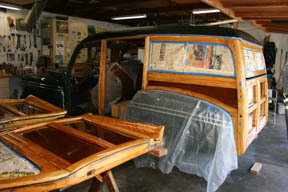 The doors are laid flat so a nice smooth coat can be applied to the panels. Lightly sand the varnish to remove any imperfections, leaving a smooth whiteish cast without any dark spots. 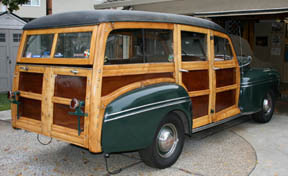 It takes several coats to get a buildup of varnish thick enough to accomplish this. The next coat of varnish should go on smooth and glossy. 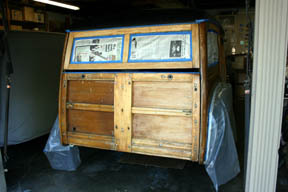 The body is hand sanded in preparation for the next coat of varnish. 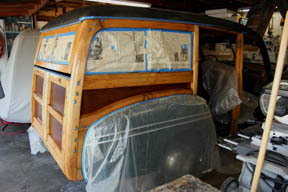 Everything is looking good after six coats of varnish, but I think one more topcoat will be even better. 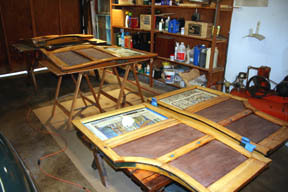 With seven coats of varnish applied, it's now time to remove all the masking and start assembling the doors. New weatherstripping was applied to the doors and liftgate. attached and need to be rewired. The taillights are rewired, the liftgate rubber seal replaced and the bumper reattached. 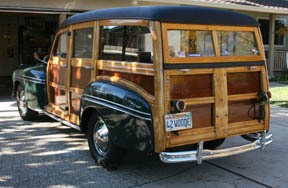 Another woodie project has reached conclusion.